Direct plug in installation replaces the stock start button and rocker kill switch. SICASS racing's over/under start/stop switch for the 2017-19 KTM EXCs and 2017-18 Husqvarna FEs. Designed to fit with the hydraulic clutch and directly plugs into the stock wiring. A direct plug-in version of the key switch for Husaberg FE. When the key is in off position all starting options are disabled. 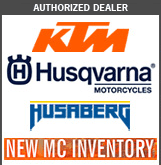 Keyed switch for KTM, Husqvarna, and Husaberg offroad motorcycles. The keyed switch wires into your existing system in minutes with direct plug in wiring. By turning to the off position and removing the key, this switch not only cuts the power to the starter but it also functions as if someone is holding down on the kill button. Included with switch is two keys, stainless steel mounting tab, and all wiring needed. NOTE: The SA-26-206 will also fit 2017-18 US model EXC and FEs that have the SICASS key eliminator, SA-26-234, installed and the OE key switch removed. This would allow for a key switch that will not have a battery draw when left on without the bike running. Keyed switch for KTM, Husaberg, and Husqvarna offroad motorcycles. The keyed switch wires into your existing system in minutes with direct plug in wiring. By turning to the off position and removing the key, this switch not only cuts the power to the starter but it also functions as if someone is holding down on the kill button. Included with switch is two keys, stainless steel mounting tab, and all wiring needed.